'What gets measured, gets managed,' said the American father of management thinking, Peter Drucker. Unfortunately, this wisdom has not yet fully seeped into the general consciousness of the UX world. But without clear results and figures you will find it difficult to promote UX among your superiors and receive more budget. Would you like to escape from your role as the in-house Clarke Kent within your company and stop performing your heroic UX deeds for your organisation anonymously, i.e. without clear evidence? Are you looking to increase acceptance and understanding of UX? If so, read on. UX is often associated with complex questionnaires and user interviews. 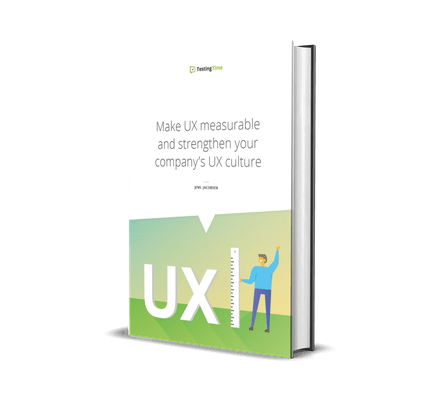 However, there is a whole array of valuable UX performance indicators that you can use to translate the success and progress of your UX efforts into tangible metrics. What is the difference between KPI and ROI? Why should you measure UX KPIs? Why is it important to measure the right data? Slowly but surely, most companies have arrived in the 21st century and are collecting large amounts of data every day. However, by no means is all data relevant: ‘In ancient times having power meant having access to data. Today having power means knowing what to ignore’, writes Yuval Noah Harari in his book ‘Homo Deus’. Many organisations use metrics such as visitor numbers to assess the success of their website. They think: more visitors → more success → all in the green. But are they really measuring the KPIs that effectively ‘move the needle’ and improve their bottom line? Or are they dealing with ‘vanity metrics’ that feel good but don’t bring about any real benefit? It’s amazing how many design decisions are still made today without relying on UX-KPI data. For example, your conversion rate might suffer from the fact that the number of form questions on a login page has increased from six to nine. Without continuously measuring the relevant KPIs, you will find it difficult to identify such problems quickly. At the end of this article, you will find out what these KPIs are all about and how you can measure them in detail. KPI and ROI – what’s the difference? Using ROI and KPI, companies can measure how successful they have been in achieving a particular goal. The ROI (return on investment) is a purely financial indicator and quantifies how successful a project was in relation to its investment. For example, if a company invests EUR 10,000 in UX activities to improve its online shop and then generates EUR 25,000 more revenue in the following year, this corresponds to an ROI of 150%. KPIs, on the other hand, are key figures that you can choose or define yourself which translate the success of a project – however it may be defined – into tangible figures. 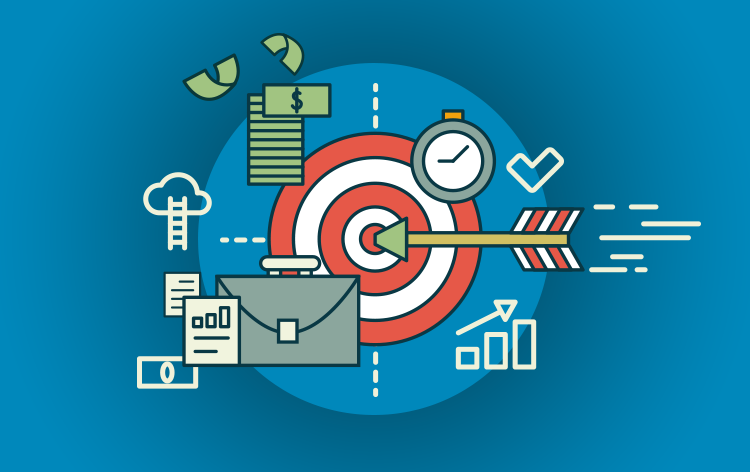 While ROI is only a financial indicator, KPIs are relevant for almost all employees of an organisation – from call centre employees to CEOs – and can be applied to a variety of processes. KPIs help you communicate your UX issues and the associated strategic goals more successfully to the relevant decision makers in your company. You no longer need to charm your bosses with vague and qualitative arguments. Instead, you can base your arguments on cold, hard facts and figures. Without these metrics, it is basically impossible to prove before, during or after a project whether your UX team&’s actions have been worthwhile and effective. Reliable data also makes it much easier to put forward arguments when it comes to setting the annual UX budget. Furthermore, if your salary includes a performance-related bonus, you will probably find it much easier to prove your ‘effect’ on the bottom line using KPI metrics. Just like planning a journey, you should first find out exactly where you are located before attempting to navigate to a destination. Only then can you move step by step in the right direction, regardless of how far away you are from the destination. With your UX KPIs, you always have a powerful business navigation tool at your fingertips that protects you from making a wrong turn and wasting valuable time (and money). UX data also allows you to benchmark your project against internal or external reference data sources (e.g. competitors, if data is available) and find out where you still have homework left to do. UX KPIs drastically reduce the complexity of large amounts of data and give you fast and accurate information about the ‘health status’ of your product. In their combined form, UX KPIs act like pulse, temperature and blood pressure for a physician, who can use this vital data to quickly determine for the entire organism whether something is wrong and might require intervention. Behavioural KPIs express in numbers what a user is effectively doing and how they interact with a product or website. Nowadays, this data can usually be collected fully automatically without the intervention of an interviewer or observer. This is therefore a fairly simple and inexpensive way to start collecting UX KPIs. 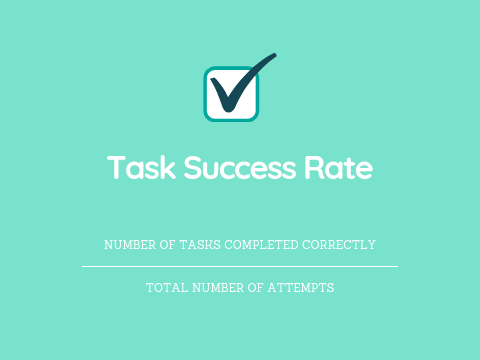 The task success rate (TSR) measures the number of correctly executed tasks and is used very frequently. If a task has a clearly defined endpoint &– for example, filling out a form or buying a product – you can measure the TSR. However, you need to be clear about what goals you consider a success in a particular case before you start collecting data. In this case, the task success rate is calculated as follows: 8/10 = 0.8 x 100 = 80% Expert tip: You should also measure the TSR of users who are performing a task for the first time. This allows you to check if or how this metric changes when the user has more experience with the service or product. Basically, the higher the success rate, the better the user experience. Navigation bars represent an important instrument within the website’s ‘orchestra’: if a user does not manage to reach their destination via the navigation, then the search function is usually the next logical step. In many cases, the less the search function is used, the better the customer experience. It is always advisable, however, to decide on a case-by-case basis which of the two metrics is more desirable. Let’s take the example of a website with only 10 subpages, which typically would have no search function and does not need one due to its clarity. Example: You give nine testers the task of ordering three sunflowers in a florist’s online shop. 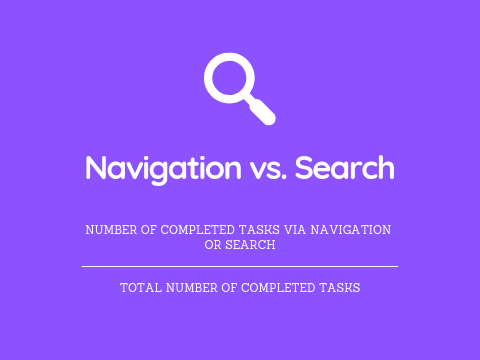 Then you analyse how many users use the navigation and search fields. The user error rate (UER) is the number of times a user makes a wrong entry. Let’s take the example of the usually unsuccessful attempt to enter the user’s date of birth in the address field. The UER gives you an idea of how clear and user-friendly your website is. The higher the UER score, the higher the number of usability problems. Again, it is important to define in advance which actions represent an error. 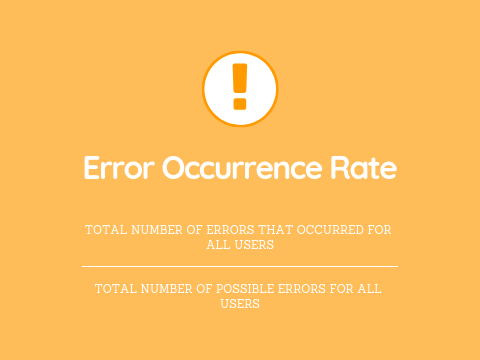 The user error rate can be calculated in different ways. Here are the two most common types of measurement: Error occurrence rate: If a task only allows one potential error (or there are several and you only want to measure one of them), this is the metric to use. Example: Five out of 100 users enter their e-mail address incorrectly in the ‘Repeat e-mail address’ field. 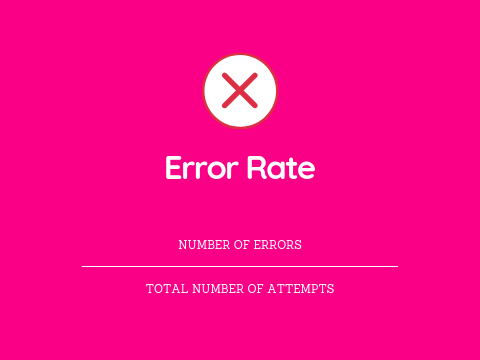 The error occurrence rate is calculated like this: 5/100 = 0.05 x 100 = 5% Error rate: If multiple errors are possible per task (or you want to measure multiple errors), you can do this using the error rate. 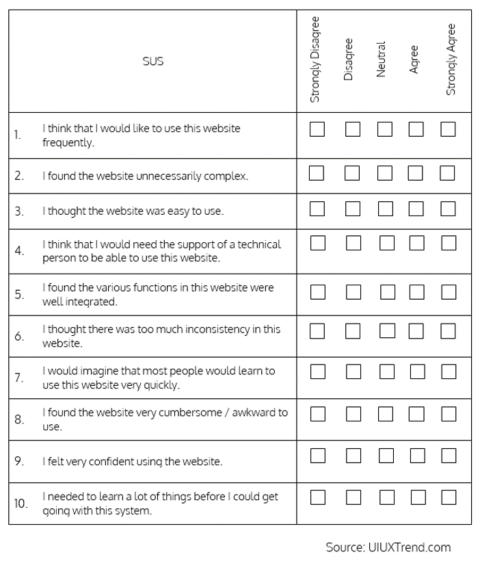 According to its inventor John Brooke, the System Usability Scale (SUS) is a ‘quick and dirty’ tool with which you can test the usability of a product. The scale consists of a 10-point questionnaire with five possible answers each, ranging from strongly agree to strongly disagree. Example: You want to measure the usability values of your website. Using the questionnaire results, you can calculate the ‘SUS’ score (0 to 100), which averages 68. Therefore, if your website scores below 68, it will typically have serious flaws and will need to be optimised. 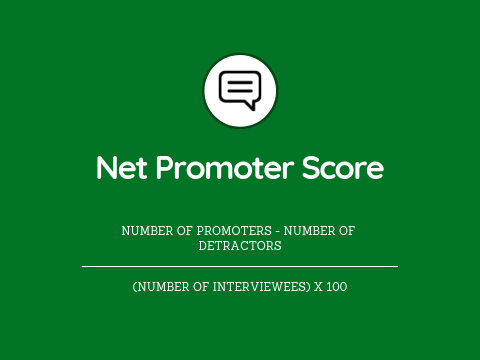 This is how the Net Promoter Score is calculated: (30 – 10) ÷ 50 = 0.4 x 100 = 40% Further information about NPS and its calculation can be found here. The CSAT score is calculated as follows: (5 / 10) = 0.5 x 100 = 50% Further information on the customer satisfaction score can be found here. Using the UX KPIs presented in this article, you already have very powerful tools at your fingertips. Finally, you can translate the value of UX into the language of your colleagues and superiors. It’s time for UX to have the status it deserves in your organisation. And the sooner you start measuring, the sooner you can slip into your Superman outfit. Have you already defined UX KPIs for your organisation? If so, what metrics do you use and why? What has changed (positively) since you started measuring? How has your influence in the company developed since then? If not, what is stopping you from measuring? What would have to happen for you to start measuring?